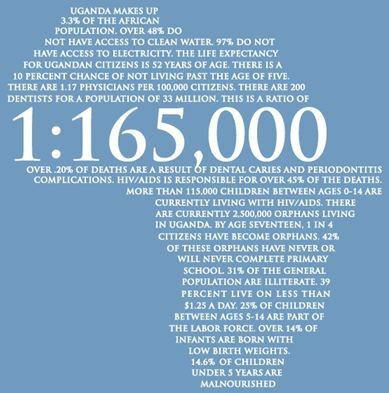 In 2011 a collaboration between Makerere University College of Health Sciences and the University of North Carolina Dental School began with the intention of providing preventative care and oral health education to the residents of the rural Nakasongola District in Uganda. Beginning in 2012, students and faculty from UNC-SOD have traveled annually to the MU-CHS campus at Mulago to develop a collaboration between the schools and the Ugandan Dental Association. Each year, students and graduates of these schools have spent a week at Makerere University and have worked together in remote clinics in the Nakasongola District providing preventative oral health care as well as extractions, restorations, fluoride treatments, sealants and oral health instructions, among other services. As each year passes, the number of treated patients grows incrementally and the construction of a clinic in this region will continue that upward progression. 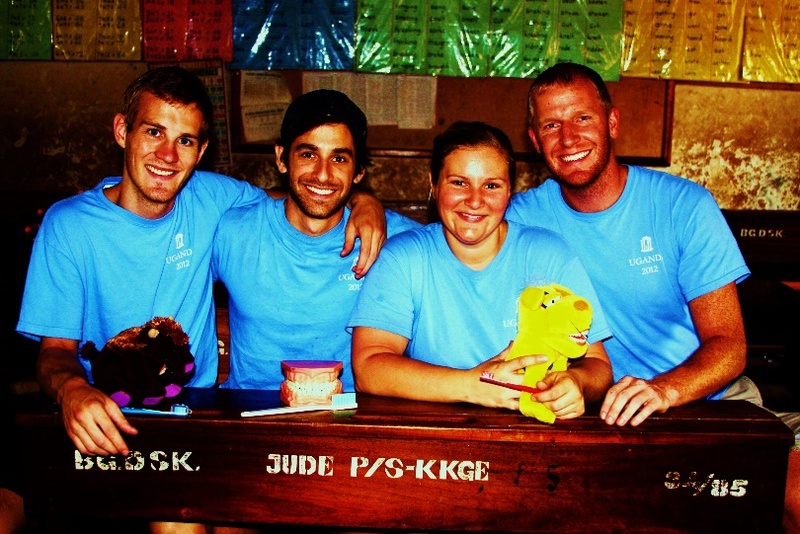 In 2011 three dental students from the University of North School of Dentistry had a vision of beginning an outreach program to Uganda. Those three students (Marc Weber, Dan Hostrander, and Katie Payne) would eventually find themselves in late July in the middle of a village in Northern Uganda depending on a car’s headlights to provide light to treat the last few patients waiting to be seen that day. From that first trip, The Uganda Project has grown incrementally each year. In total 29 students from UNC School of Dentistry have participated over the last six years with Dr. Michael Farmer (Adjunct Faculty at UNC SOD) attending each of those trips. While the students change each year, the heart of the program stays the same: providing caring dentistry to those in need. The program has a focus on prevention and oral health education to those without access to dental care. Each year thousands of toothbrushes are distributed to local students, teachers, orphans and Ugandan residents along with instructions for how to care for one’s teeth and gums. The trip currently consists of four dental students who have completed their first or second years of dental school. Throughout the year these students raise money through various fundraisers to be able to make the 24+ hour journey to Entebbe, Uganda. From Entebbe, the students travel to Kampala, Uganda’s capital, where the students spend a week at Makerere University shadowing a variety of dental students and staff including Oral Surgery professors and residents where learning pathology is hands on. The students see a variety of conditions that previously have only been taught to them in textbooks. The severity of the pathological conditions are so extreme in many cases due to the lack of access to care and inability to afford treatment. Many people try to treat their ailments with homeopathic remedies for extended periods of time before finally giving in and making the sometimes days-long journey to the capital to seek care. While this is often a harsh reality for the students traveling on the trip, it is very eye-opening realization of some of the struggles of living in a third world country. At the same time, having hands-on learning provides a much greater understanding to the students of the pathological processes, treatments, and expectations of treatment of many rare conditions. One of the main goals of spending the week in Kampala, a bustling city full of dirt bikes and vans used for taxis, is building the relationship between UNC SOD and Makerere University. Over the seven years, many steps toward a promising partnership have taken place. Dr. Farmer has provided lectures to the faculty and students on multiple occasions regarding new advancements in dental technology. 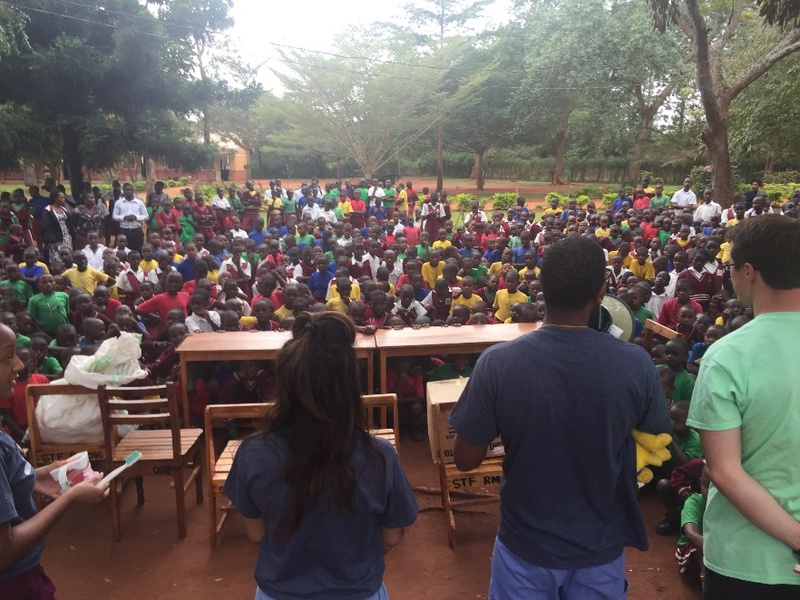 Dr. Adrian Kamulegeya and multiple Oral Surgery residents have travelled with Dr. Farmer to the remote villages in Northern Uganda to provide care alongside the dental students from UNC SOD. Starting in 2018 a team from Makerere will begin doing pathology consultations via teleconference for the first time, allowing for consultations with pathologists and residents at UNC SOD regarding the pathogenesis, complications of the condition, medical options and surgical treatment options for the patient, providing a learning experience for both Ugandan and American students thousands of miles apart. In the near future, the project hopes to increase other collaborations between the two universities. Dr. Farmer has blueprints to build a clinic that would provide preventative care and education to the people of the Nakasongola region as a joint outreach of UNC SOD and Makerere University. The clinic would provide a much-needed opportunity for local children and adults to receive cleanings, sealants, fluoride treatments, fillings, extractions, dentures and other dental services without having to travel many hours for treatment that they cannot afford. In addition to the goal of improving access to care, the clinic would provide an opportunity to train more dentists in Uganda as well. Currently about 12 dentists graduate each year in the entire country of Uganda. The current output of dentists leaves the country at an estimated ratio of one dentist for every 165,000 people. One goal of the clinic would be to produce at least 3 more dentists each year through Makerere University and to have one more clinical faculty member that would rotate through the clinic to allow the clinic to be open year-round. The proposed clinic would act not only as a dental clinic but could be used by medical, nursing, optometry, women’s health, engineering, water access, or educational teams, to name a few options. This model is loosely based on UNC’s Malawi project that has been extremely successful. There will be housing for up to 32 people at any time that will be built alongside the clinic. A state of the art operating room outfitted with new equipment funded by a grant from the Polish government is already in use at the adjacent Medical Center and could be used by teams of surgeons at any time. The clinic will be built by local Ugandans, creating an opportunity for the local economy. Project Uganda currently treats over 500 patients each year and educates and provides toothbrushes to at least 2,000 people each year. In the future, Dr. Farmer hopes that the clinic will provide continuous, comprehensive care to many more Ugandans. Until then, he continues along with the four students each year, trying to make a difference halfway around the world.